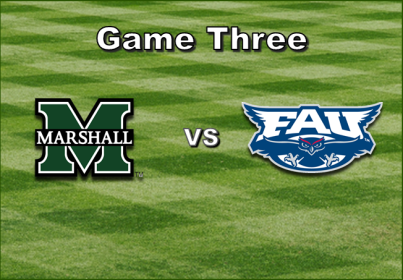 The Owls go for the sweep this afternoon against Marshall. Game starts at 12 PM. Marshall: CF Bird, ss Leon, LF Gee,1b Diffenderfer, DH Bossi, 2b King, 3b Dundon, C Reed, RF Fajardo. RHP Taylor will get the start for the Thundering Herd. FAU: DH Kerr, 2b Lashley, RF Sanger, 3b Santiago, CF Collins, 1b Puerta, LF Dicks, ss Chatham, C Miller. LHP Rhodes will toss the first pitch for the Owls. Top 1: The noon bell tolls as Rhodes fires in a strike to get us started in Boca. Top 1: After a quick out, Santiago commits an error that gets a runner to 2nd, & an infield single sets up runners on the corners & 1 out. Mid 1: A pop-out & a failed attempt at a double steal gets Rhodes out of the inning unscathed. 0-0 game early on a partly cloudy afternoon. Btm 1: 2 singles sets up a rare 2-base sacrifice fly by Santiago that gives the #Owls a 1-0 lead! End 1: Collins pops a ball into no mans land that scores Lashley, but is thrown out trying to stretch for a double. #FAU now leads 2-0. Mid 2: Rhodes allows a runner to 3rd, but gets a pop-out to end the inning. 2-0 game, Puerta will lead off for the #Owls. End 2: Chatham grounds into a 4-6-3 double play to end the inning. 2-0 #FAU with Rhodes returning for his 3rd inning.